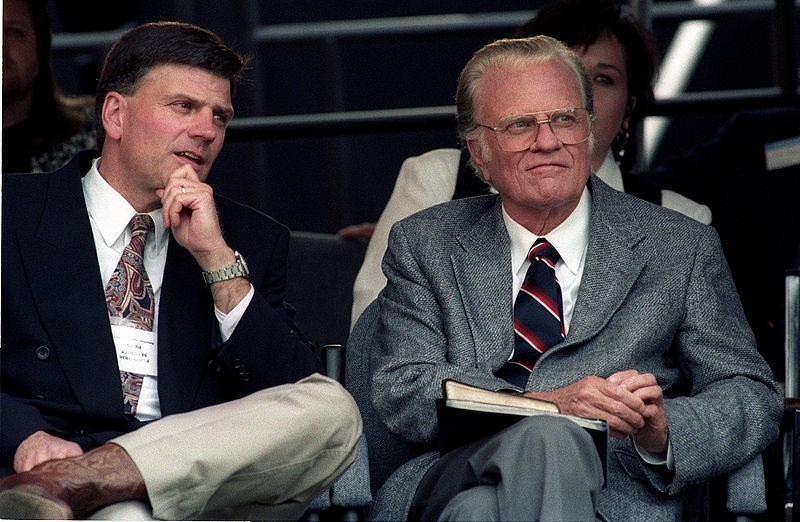 Franklin Graham is the son of famed evangelist Billy Graham and heads both the Billy Graham Evangelism Association and the international humanitarian and health aid group, Samaritan’s Purse. Lately, the 63-year-old Graham has been in the news for more than preaching the gospel and delivering aid in the developing world. A lot of the attention Graham has garnered in the past month or so involves his increasingly public positions on issues ranging from preventing Iran from getting nuclear weapons to making sure boys and girls play with gender-appropriate toys sold by Target. The tax-subsidized evangelist (donations to his organizations are treated as tax deductible for federal income tax itemizers) has also attracted some distinctive attention on the fiscal side regarding his $880,000 annual income from the two organizations he runs. Last week, he weighed in against the nuclear arms treaty with Iran, joining 200 retired generals and admirals denouncing the deal. “They made it clear that this [nuclear deal] threatens national security—and these men know!” Graham posted on his Facebook account, presumably concluding that those generals know more than their counterparts who issued a letter earlier in August endorsing the proposed treaty. “I think Congress had better listen,” he added. This past month, he attacked Target for ending its practice of “gender-based signage,” particularly in its toy aisles, eliminating advertising and pitching toys by traditional gender roles (for example, assuming that boys should play with building sets and girls with dolls). “I think Target may be forgetting who has made their stores strong,” Graham opined. “It’s not gender-neutral people out there—it’s working American families, fathers and mothers with boys and girls they love. What’s next? Are they going to try to make people believe that pink or blue baby showers are politically incorrect?” That led Graham to a call to boycott Target, apparently for violating Biblical teachings about the kinds of toys boys and girls should play with. Along with Target, Graham is campaigning for a boycott of Wells Fargo for its television ad about a lesbian couple with a daughter. Supporting Graham’s ability to pontificate on a range of public policy issues is that Graham is extraordinarily highly paid as the head of a faith-based charity. The Charlotte Observer, a newspaper that pays close attention to dynamics in the tax-exempt sector, revealed Graham’s compensation of $622,000 from Samaritan’s Purse and $258,000 from heading up the Billy Graham Evangelistic Association. His organization defended his salary in the usual way, saying it compared Graham’s rate to comparable organizations to find the appropriate number. Worth noting is that most of the years of 990s filed by the BGEA list salaries for Billy Graham himself and for W. Franklin Graham IV, Franklin Graham’s son, and other family members. Also, this chart doesn’t reveal the contributions to Franklin Graham’s two retirement packages, which, in 2008, when added to his salaries, came to $1.2 million.